One of the games I've been looking forward to for a while now has been Heavy Rain. I just got the game recently and have only played through a few hours, but I fount it interesting enough that I wanted to share a few thoughts about it (which is more than I can say for most games). For those who've not heard of the game, it's probably best described as an interactive movie. In terms of subject matter, well, I haven't progressed very far, but some interesting stuff is happening. You play a few different characters throughout the game. There a troubled father, a private detective, an FBI agent, and a journalist. They're all part of a noir-like serial-killer mystery. Things have not progressed very far for my story yet, but one of the big draws of this game is that supposedly the storyline changes depending on the choices you make. Indeed, there are times when it feels like I'm playing a choose your own adventure style story, albeit one with more interaction than you typically get with those books. This is an interesting dynamic, and one that I'm a little suspicious of. There are certainly times when I feel like I'm on rails and I question whether or not my actions will really matter within the game. However, this is based mostly on previous experience with such "branching" games that give you lots of choices that all lead to the same place (or, sometimes, two places). From what I've heard, choices do matter in this game, and I've decided that for my first playthrough, I'm just going to stick with whatever decisions I've made (so I can't really act on my suspicions by replaying a level... yet). As far as I can tell, I've made several mistakes. As of yet, I have no idea how those mistakes will impact the outcome of the game (or if they will at all), but I will have some incentive to replay the game after I'm done. In any case, one of the interesting things about this game is that it actually lets you make mistakes in the first place. In 99% of video games, making a mistake means you die and have to restart the level or something. In Heavy Rain, you (presumably) have to live with your choices. Again, I'm a bit suspicious of this. There are times when I can definitely detect the presence of rails. I don't want to ruin the opening of the game, but is it possible to avoid the event in question? At a later point in the game, I missed a key quick time event... and yet, I survived. I found that suspicious. Supposedly, if you make enough mistakes, you can cause your characters to die (and yet the game will go on)... but how many mistakes? And how often can you die? Clearly not every dangerous situation can lead to death? Speaking of quick time events, this game is heavily reliant on them. However, unlike, say, Uncharted, this game actually makes good use of them. As previously mentioned, you're allowed to fail. At some point, I presume failure means death, but not in the dumb way that some games do it. Apparently, in this game, death means your character is not coming back. In any case, the QTEs are well done and surprisingly varied here. There have only been a few times that I've gotten tripped up with my controller (one interesting tidbit - the game's difficulty meter is based entirely on how well you know the PS controller). It makes use of most of the buttons, but in a realistic sorta way. There might be some Do it Again, Stupid elements in the game, but they're not as frustrating or widespread as they are in a lot of other games. The control scheme is a bit weird though. It's a mostly third-person game, but instead of the dual-analog controls most games use, this game uses the R2 button to move forward and the left analog stick to choose direction. The right analog stick is mostly used for interacting with the environment (whereas most games use the right analog to allow you to move the camera around). They do provide some limited camera control in the form of pressing L1, which will change to an alternate view, but this still ends up being somewhat awkward, and I still find myself often trying to use the right analog stick to move the camera. These sorts of issues are not entirely uncommon in third person games, but the R2/Left Analog system does take some getting used to and is definitely the most awkward thing about the game. On the other hand, the interaction scheme isn't really all that complicated. Some of the interactions can be a bit confusing at first, but for the most part, you just hit the buttons or move the sticks in the way they appear onscreen. It's pretty easy to pick up and go. There are a lot of games where you have to memorize the gameplay mechanics and mentally map the mechanic to the buttons. In some games, this can get quite complicated and not playing the game for a while can really confuse you when you pick it up again. Aside from getting used to the way you walk around, I imagine Heavy Rain will not suffer from this at all. Visually, the game is quite impressive, though I do think that in the wake of Avatar, video games have their work cut out for them. The camera is very cinematic, even during non-cut-scenes (and besides which, this game sorta blurs the line between cut-scene and gameplay), but the characters aren't always perfectly realized. There are times when Heavy Rain shines in this respect, but it doesn't quite make it all the way across the uncanny valley on a consistent basis (the way that Avatar did). 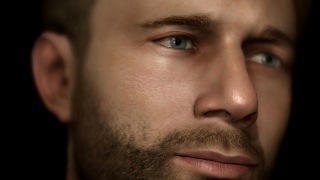 Some characters are better than others and the between-chapter closeups (see image above) of characters faces, for instance, are nearly perfect. The in-gameplay visuals aren't always quite as successful, but are still impressive by general video game standards (see image below). 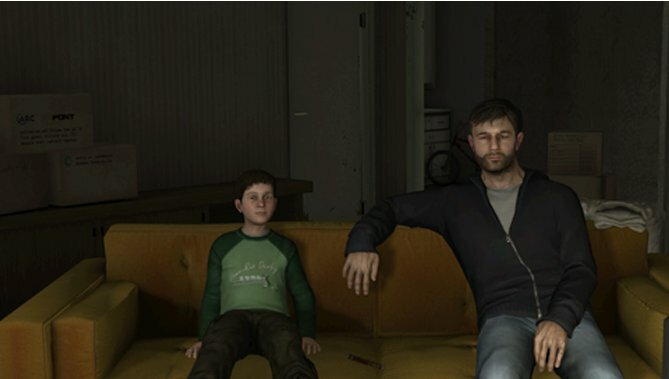 For all intents and purposes, though, the game looks great (and besides, even though both stories are somewhat derivative, Heavy Rain has a better plot than Avatar so far). The voice acting is actually pretty good, despite the fact that most of the actors have a bit of a French accent. I mean, most voice acting in video games is pretty bad, so it's hard to fault Heavy Rain on this, except that Heavy Rain does rely on voice acting more than most games. The music is well crafted, low-key and atmospheric, which is perfect for the game. One other interesting meta-note is that 99% of the trophies for this game are "hidden" (at least, in the game itself - when you view trophies, all you see is a long list of ??? trophies). This probably makes sense when you think about it, as some of the trophies might give away plot elements. It also probably ruins the immersion the game is going for to list out the trophies and have people looking to earn them instead of playing and enjoying the game for what it is... Still, I found this interesting. This clearly isn't a game for everyone, but it appears to be right up my alley. I love open-ended video games, and if this one delivers on its promise, I think I'll be very happy with this game. The first hour or so is a bit slow, but things seem to be moving along at a better clip now, and while the story hasn't developed much yet and the controls might be a bit weird at times, I find myself fully engaged with the game. Unlike most games, I'm actually a bit intrigued with the storyline and there have even been a few emotional moments within the game that were reasonably effective. I can't imagine that this will sell well, and I'm positive many people will be frustrated or bored by the opening sequence of the game (the first thing you have to do is brush your teeth and take a shower - hardly exciting stuff) and turn it off in disgust. This isn't an arcade game. It's more like an updated, easier to use text-based adventure game. The extensive cut-scenes, controls and QTEs will probably get on people's nerves as well. But I find myself drawn to this game more than most, and I have a feeling that I'm going to want to replay it several times. Update: Well, up until now the game has been fine, but it appears that the reports of bugginess are somewhat accurate. Just had my first freeze. Tried to exit out and reload, and now it froze during the loading screen. Also of note, the FBI agent's voice acting is so bad it's kinda funny. I'm not exactly sure what they're going for, but it sounds like a Frenchman attempting to imitate either a Boston or New York accent. The output is a bizarre mixture of all three accents. Heh.